Award-winning design, features, and safety made specifically for a growing family. 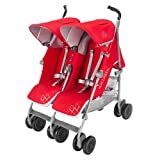 Two Techno sets the normal for simple maneuvering and smooth journey in a full-sized double umbrella fold infant stroller that fits through regular doorways. Ideal for infant babies and children up to 55lb each. Featuring individually adjustable whole recline 4-position seats with convenient one-handed adjustment, extendable leg rest, built-in Baby Safety System, and coordinating head hugger and shoulder pads.